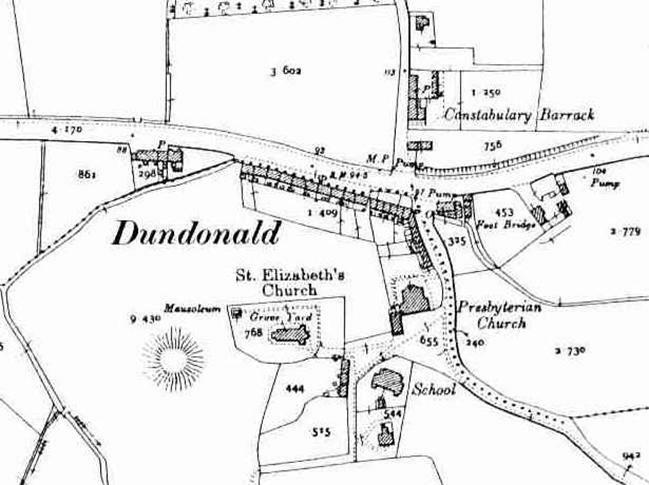 The name Dundonald is an ancient one. It translates as “the fort of Domnall” (The modern form of Domnall is Donal). This probably refers to a rath which was situated on Moat hill, now the site of St. Elizabeth’s old church and burial ground. A rath was a circular construction, usually a high bank surrounded by a ditch built to protect a homestead. The discovery of several souterrains in the nearby area seems to confirm this. A souterrain was a stone lined tunnel built as a hiding place for people and property in the event of attack. Sometime around 1177, John de Courcy came to Ireland, part of a force of Norman invaders who were ‘invited’ by one of two feuding Irish kings. John was from Somerset in England though he could trace his line back through his great grandfather to the first Norman army that had come to England with William the Conqueror of France. He was a very ambitious man and decided to invade the north of Ireland which was in the power of the Irish clans. Without the permission of the Henry II he went north and defeated various clan kings. He divided the land between his Knights building a network of ‘castles’ to secure the territory. These were at first wooden forts built on top of large mounds of earth. Often the Norman’s choose sites on or beside the raths of the Irish farmers. 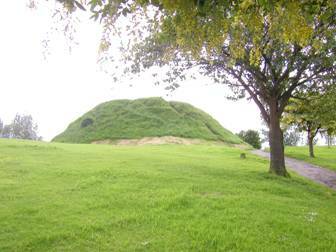 The motte at Dundonald is one of the largest in Ulster. It probably was built near the start of the conquest by Irish serfs or prisoners. Sitting atop a hill it is still an impressive landmark even today. One can only imagine how imposing it would have looked to the 12th century inhabitants of the area. It was from here that the Norman’s ruled. This fort would have been an important civic and military centre in the surrounding manor. The first lord was a French speaking knight who is recorded in one of de Courcy’s charters as “Richard de Dundoenald”. Later as the area settled and became quiet again the Normans built a small chapel beside the motte. Remains from that original church have been found in the old Episcopalian church built on the same site. At the time of the coming of the railway, Dundonald was a still small village. 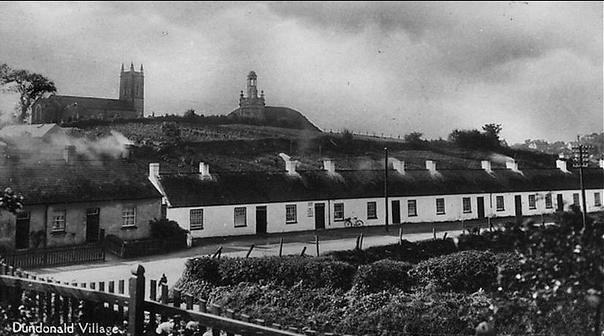 A long row of whitewashed cottages called “Gape Row” lined the main Newtownards Road. The skyline was given a distinctive character by St. Elizabeth’s Church of Ireland, the Cleland Mausoleum and the ancient Norman Motte. 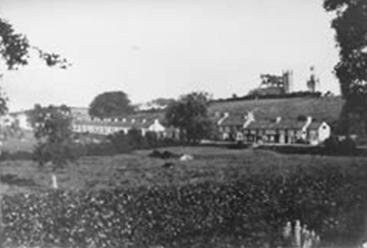 This picture was taken some time around 1930 from a farm known as ‘the Beeches’ (today the site of the Ulster hospital). It’s hard to imagine now but at this time Dundonald was quite a popular beauty spot for visitors. The Belfast Telegraph called it a “ramblers’ paradise” and often visitors from Belfast would spend the day exploring this quaint little old-fashioned village. Click >> here << to read an extract from the 1924 edition of the Belfast & County Down Railway Company’s Official Tourist Guide to County Down and Mourne Mountains. Their ghosts now come and go. Agnes Romilly White was the daughter of the Rev. Robert White, the rector of St. Elizabeth’s Church of Ireland. She lived at Dundonald between 1890 and 1913. 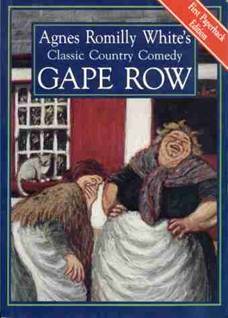 The life of the village was the inspiration for her two novels, Gape Row (1934) and its sequel, Mrs. Murphy Buries the Hachet (1936). Both books are a good read. Particularly humorous is the conversation which is in the Ulster Scots dialect that would have been used in the village at that time. “Can Jinanna escape the poorhouse? Will young Johnny Darragh jilt Ann? Will Mary get saddled with the awful Andy John McCready? Or will Happy Bill, the wayside preacher, nip in first and win them all for God? The characters mostly make use of the tram that came as far as the cemetery on the Newtownards Road. This was within walking distance of the village. In itself this is an illustration of the competition that existed against the railway. The map below shows the village in 1902. 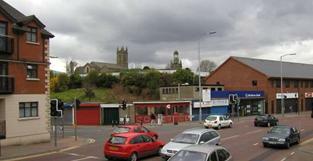 The road running across the centre is the main Newtownards Road. Click >> here << to see a larger map of the surrounding area.